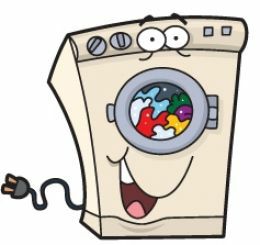 Being Frugal and Making It Work: Shopping for a Washing Machine? Take a Load Off! With two young children and a husband who works outside year-round, doing laundry is a never ending process. Sorting, washing, folding and then putting it away. I don't mind washing our laundry, but I hate folding and putting it away! Having a washing machine that works great and gets our clothes super clean is a must have! We recently had to purchase a new one, and we were only interested in the most powerful washing machines available. We wanted one that was going to last, and keep our clothes clean and looking newer, longer. To be honest, in the beginning I was a little overwhelmed. There are so many different styles, brands and features on washing machines in this day and age - it can be a little confusing. Bosch, Whirlpool, Hoover, and more... where do you start? Wash load capacity, energy rating, and durability were among our top concerns and priorities. We did our research before we went shopping and that gave us an advantage and a little knowledge. In the end, we chose a front load washer and dryer set that has proved to be everything we could have asked for and more. I can't believe how clean and fresh smelling our clothes are after every wash. Which washing machine feature is most important to you? We need new ones! I want front loading too! Hopefully we can save and get one eventually! I would love a front loading washer because I am short and sometimes I can not reach in to get all the clothes out of our top loader. The step stool comes in handy for me. We definitely pay attention to the efficiency of our machine and how much water we're using. We hate to waste it. I would love to get a front-load machine, but what I really look for is the amount if energy and water usage. We're keeping our eyes open for a new washing machine too. Ours is still usable but it's going to konk out any day now. The most important feature to me is probably efficiency. As long as it has enough capacity to wash our biggest comforter/sleeping bags then that's good enough for me. I love my Whirlpool Duet! It is a front loader and works so fantastic. Great post! Getting clothes clean is my top priority. I do prefer the top loaders. I have a set of LG front-loaders and love them!